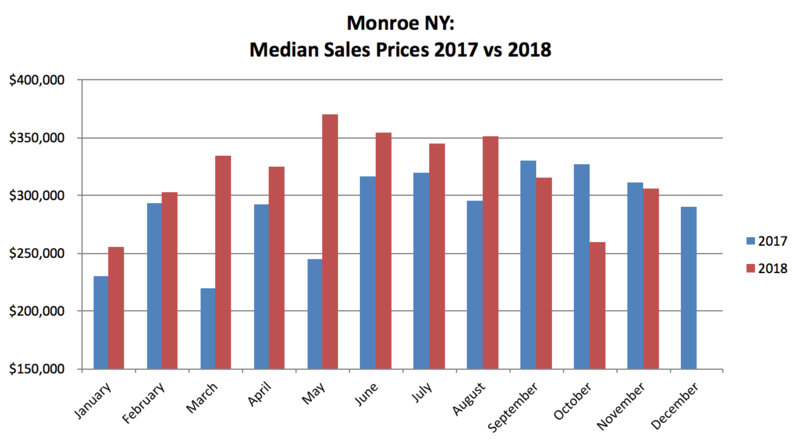 The Monroe, NY real estate results are available for November 2018. The number of monthly sales and available inventory decreased from last month and sales prices increased. Monroe is still experiencing a balanced market. That makes now a good time to buy or sell. Following is an overview of the November 2018 Monroe NY results. In the month of November 2018, there were 14 sales. This number was nearly half of the previous month and 20% less than the same time last year. Sales do tend to decline late in the year, so the decrease is no surprise. In terms of inventory, at the end of the month, there were 120 homes on the market which is 46% higher than the same time last year. So while inventory is currently dropping (from 128 in October), the market remains balanced and it is not the seller’s market of last year. The median price for November 2018 was $306,450, which is 18% higher than last month and 2% lower than last year. As indicated in my October report, October sales included 30% foreclosed properties which may have pulled the results for that month down. Since median prices have been above $300K for much of the year, we may be back to “normal” for the year. The homes that sold in January took more than four and a half months to get to signed contract. In November, the time to get to contract for the homes that sold was around two and a half months. Shorter time to contract typically indicates a hotter market. The Monroe market remains healthy. The real estate market in the town of Monroe NY has moved into a more balanced market. Prices in the last month seem to be back to normal for the year. Overall inventory levels are decreasing slightly. This is still a great time to sell or buy. If you are a seller and want to put your home on the market, let’s do it. If you are a buyer, it’s important to be ready to go. The best way to ensure you’re ready to sell or buy is to talk to a real estate professional. I’m happy to help if you are in Monroe or Orange County! To get started, call me on 914-419-0270 or email me at kat@thehousekat.com.